Austrian jurisconsult and journalist; born at Pastelberg March 17, 1846. Graduating from the University of Vienna, he engaged in practise as an advocate, in which career he displayed such marked ability that some years later the Reichsrath appointed him its chief stenographer. 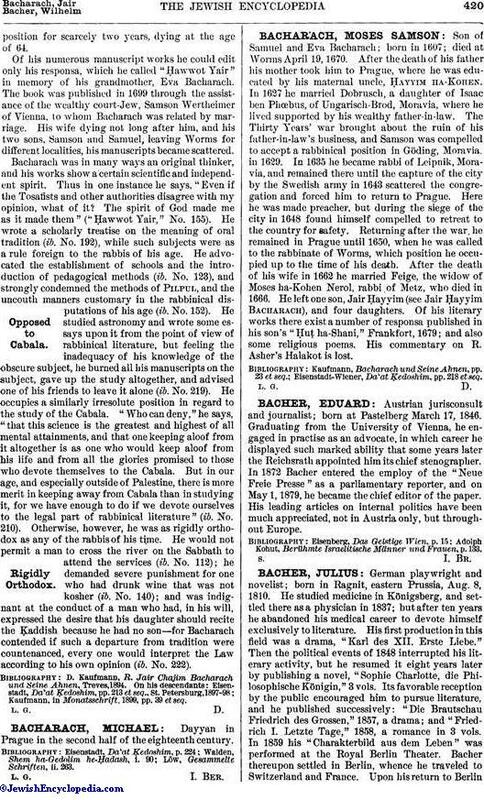 In 1872 Bacher entered the employ of the "Neue Freie Presse" as a parliamentary reporter, and on May 1, 1879, he became the chief editor of the paper. His leading articles on internal politics have been much appreciated, not in Austria only, but throughout Europe. Adolph Kohut, Berühmte Israelitische Männer und Frauen, p. 133.